His partner’s imaginary… but the madness is all real! Can Spencer and Locke survive their deadliest foe yet? 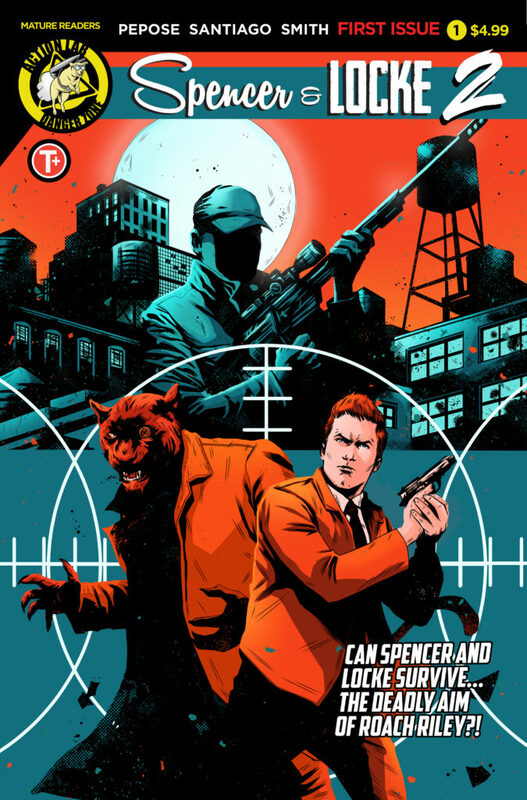 SPENCER & LOCKE 2 is due in stores and Digital Devices Winter 2019 from Action Lab: Danger Zone. The Ringo-nominated saga returns in SPENCER & LOCKE 2, written by David Pepose and illustrated by Jorge Santiago, Jr.! Suspended by Internal Affairs, Detective Locke continues to wrestle with the demons of his past alongside his trusty partner, his talking imaginary panther Spencer. But when Spencer and Locke face Roach Riley, a scarred former soldier set on violence and terror, will their partnership become the latest casualty on Roach’s hit list? Find out when the twisted nostalgia of Action Lab’s SPENCER & LOCKE 2 arrives in comic shops and digital devices Winter 2019, or be one of the first to enjoy the story at San Diego Comic-Con with an exclusive variant of SPENCER & LOCKE 2 #1 by artist Joe Mulvey! The first volume of SPENCER & LOCKE recently earned five nominations at the 2018 Ringo Awards, including Best Series, Best Writer, Best Cover Artist, Best Colorist and Best Letterer. A former crime and politics reporter, David Pepose has gone on to work for companies such as CBS, Netflix, and DC Comics. When not developing properties for comics, TV and film, David has also written and performed at the Upright Citizens Brigade Theatre, Gotham Comedy Club and PUNDERDOME 3000. A St. Louis native and a former New York City transplant, David lives in Los Angeles. Follow him on Twitter at @Peposed. Born on the desolate planet of El Paso, Texas, Jorge Santiago, Jr. began training in the Comic Arts at 17. After self-publishing for years, he left for the planet Georgia, where he earned his MFA in Sequential Art from the Savannah College of Art and Design and has been practicing making the perfect comics. He graphic designs by day and makes comics by night, and is best known for his popular webcomic, CURSE OF THE EEL. Follow him on Twitter at @JorgeSantiagoJr. Born in Elk City, Oklahoma in 1982, Jasen Smith has been drawing his entire life. After serving as a newspaper writer, cartoonist, and voice jockey, Smith later moved to Arizona and became a freelance graphic designer, leading him to a career as a full-time colorist in 2013. He has since worked with the biggest comic book publishers in America, including Top Cow, Aspen Comics, DC Comics, Image Comics, and more. Follow him on Twitter at @Jasen_Smith. Along with his lettering work for publishers such as Image Comics, Dark Horse and BOOM! Studios, Colin Bell is known for being the SICBA Award-winning writer behind the popular all-ages title DUNGEON FUN (Comic Book Resources’ 61st Best Comic of 2013) and back-up strips for Titan Comics’ DOCTOR WHO: THE TWELFTH DOCTOR. Follow him on Twitter at @ColinBell.